My husband and I birded along the Sentry Trail on Antelope Island for the first time yesterday (approx. noon - 4). Although the bugs made the lower elevations a little unpleasant even with insect shield hats and DEET, we were thrilled with our life bird, the Horned Lark. We are confused by sparrows we saw (see attached photo). Bird #2 looks to me like a classic Chipping Sparrow, and #3 does as well. No. 1, 4, and 5 confused us because they have the center spot on their chests and additional face markings. 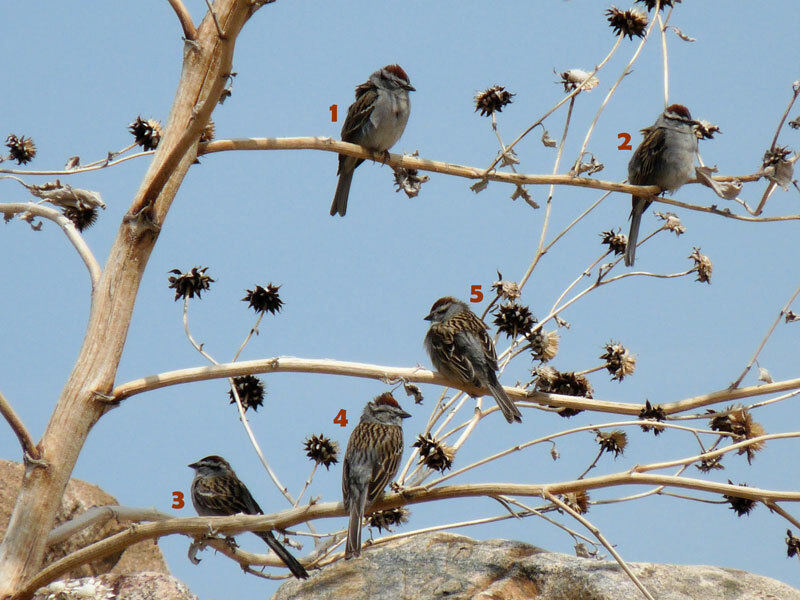 They don't follow classic American Tree Sparrow patterns, though. Northern Waterthrush - life bird! Overall a great -- but exhausting -- excursion.